Clarion Ledger, Oct 15, 1983. 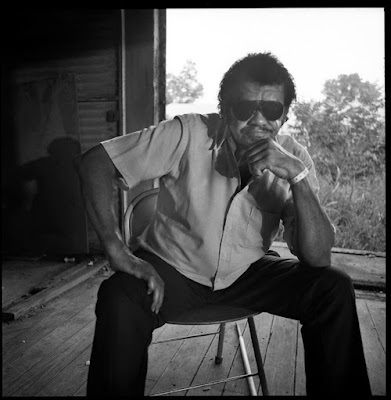 This short film offers new details about the life of a largely undocumented musician from Madison County, Mississippi named Belton Sutherland, who recorded for Worth Long and Alan Lomax in 1978 for the documentary film, The Land Where the Blues Began. We have located his burial records and hope to erect a marker for this fiercely iconoclastic artist, whose clever lyrics and true tone grabs any listener almost immediately. Belton Sutherland was born on February 14, 1911--the same year as the legendary Robert Johnson. His parents, William and Hallie Sutherland, already had eight children, and they would have four more after Belton, making a total of thirteen. 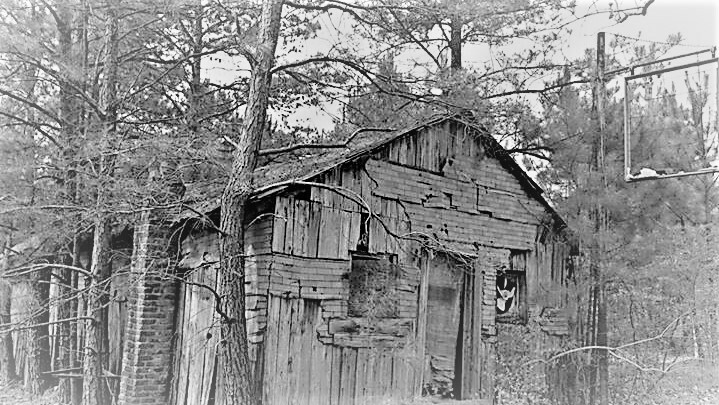 He lost his mother shortly before his eighth birthday, and he had married and moved to Holmes County by the age of eighteen. 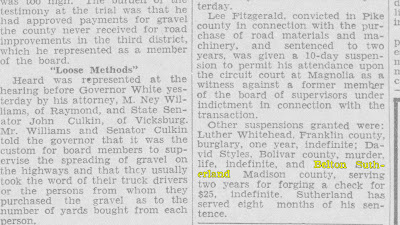 By the late 1930s, however, he came back to Madison County, got arrested for forging a $25 check, and served eight months of a two year prison sentence before the remainder got suspended by the governor. Clarion Ledger, Mar 10, 1937. A crowd of 45 people gathered Thursday at Little Zion Missionary Baptist Church on Money Road to celebrate the erection of a headstone marking the grave of blues great Robert Johnson. "I think it is going to be real good for the church and the community. 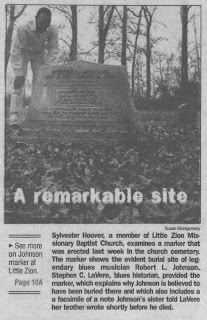 This guy was popular,” admitted Sylvester Hoover, chairman of Little Zion's Deacon Board. 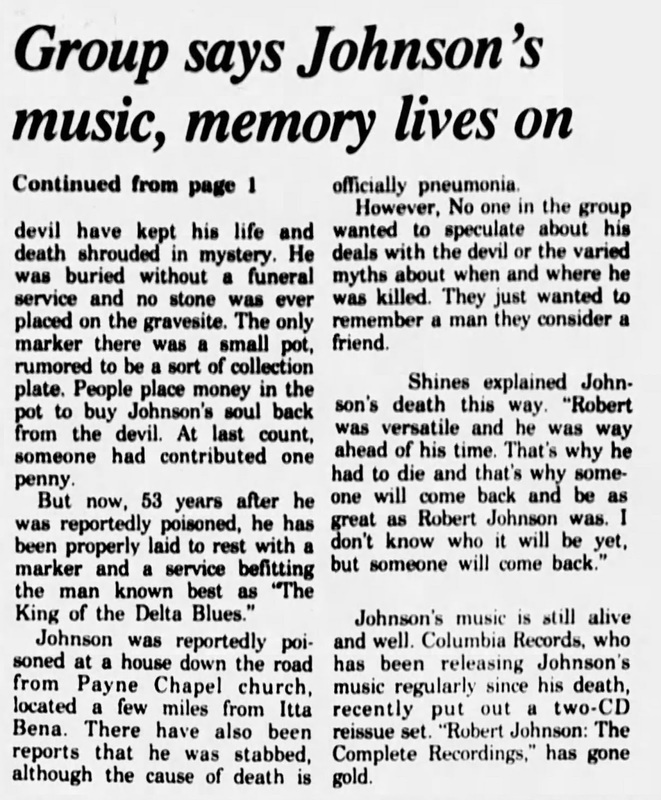 The exact location of Johnson’s grave has been a source of disagreement over the years, and the marker probably won’t change a lot of people’s minds about the location of the musician’s final resting place. It wasn’t until last year that Little Zion member Rosie Eskridge told blues historian Steve LaVere of Greenwood and the Commonwealth that she remembered that her husband, Tom, was in charge of Johnson's burial Aug. 16, 1938. Gaylon Wardlow of Pensacola, Fla., who describes himself as a “blues investigator,” said with other little-known Eskridge's version fits details of the Johnson case. Wardlow said he uncovered Johnson's death certificate in 1968. 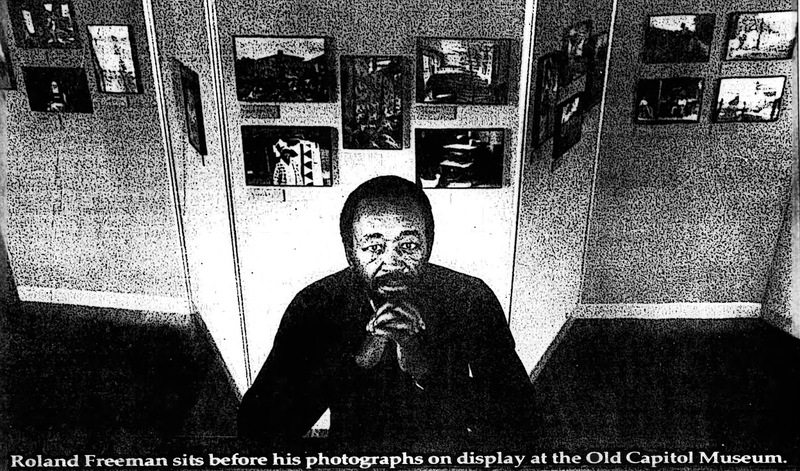 Although the document did not list a doctor, it did list that information about Johnson was provided to the coroner by Jim Moore. Wardlow said Moore had been a worker on Luther Wade's plantation at the time of Johnson's death. 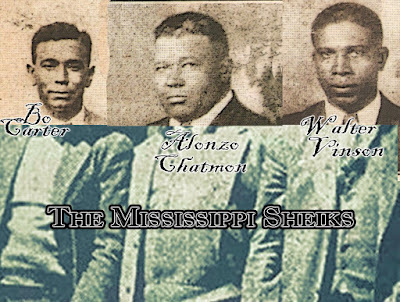 The plantation was directly across the Tallahatchie River from Little Zion church, he said. Wardlow said he picked the Commonwealth's story off the Associated Press wire and wanted to pursue it further. Eskridge attended Thursday’s ceremony but did not speak with reporters. Wardlow said Eskridge confirmed another detail disclosed on the back of Johnson's death certificate that Johnson was buried in a homemade coffin supplied by the county. "She didn't know about the back side of the death certificate," which contained the details about the coffin and Moore. 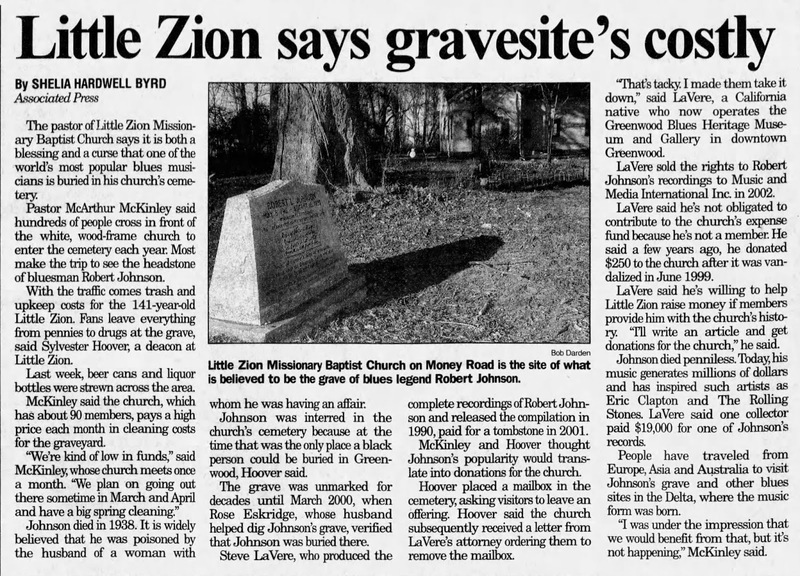 Some confusion was created when the death certificate listed Johnson's burial as taking place in "Zion Church” Cemetery and not Little Zion, he said. Little Zion's Hoover said he knew little about Johnson and his influence on the world of music. "I went to school here, and they didn't teach me nothing about this guy," he said. "I'm glad he's here. He's in the right place." Wardlow said he believes Johnson was the victim of syphilis and not foul play when he died at the age of 26. One popular story is that Johnson was poisoned by the jealous operator of a juke joint. 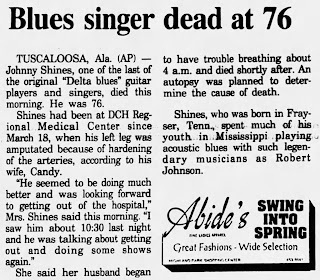 "Robert Johnson knew he was going to die from complications of syphilis. He had the bad eye," Wardlow said. 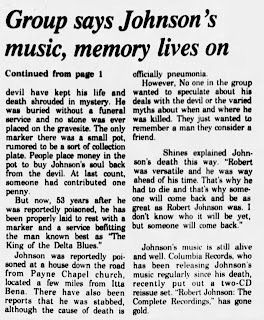 Wardlow also said the story that Johnson sold his soul to the devil in exchange for supernatural musical talent is a myth. 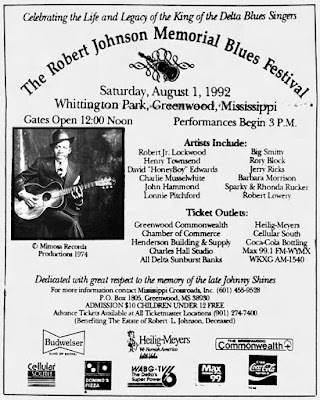 "Robert Johnson did not sell his soul to the devil at the crossroads," he said. When Johnson died, he "went to a spiritual heaven, not with Satan and the devil," Wardlow said. Wardlow said he provided the $684 granite headstone veneered in black. Although an inscription hasn't been made on the marker, Wardlow said he had a few ideas. He’ll probably write 'Legendary Mississippi Bluesman' or 'Most Influential Bluesman of All Time. May He Be in the Heavenly Way,"' he said. The Rev. McArthur McKinley, pastor of Little Zion, said the celebration of the marker was appropriate. "I'm glad we finally found him. We'll take it from here," he said. "Take it" is right. The next week, they took it right out of there, allegedly planning to erect a taller marker. The Greenwood Commonwealth, Aug 27, 2001. A headstone was finally placed in the early months of 2002. 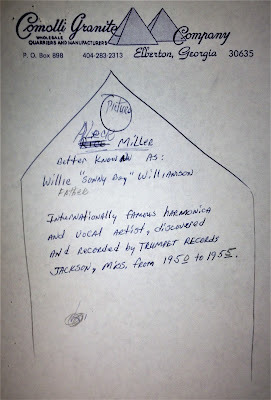 Whereas Gayle Dean Wardlow had graciously agreed to pay for the first marker as well as contribute to the supposedly massive second marker, Steve LaVere ended up footing the bill for his specialty marker, which contained the highly questionable handwritten letter supposedly written by Robert Johnson. LaVere, however, never allowed anyone to examine the letter to verify its authenticity. Thus, still today, it remains highly dubious. Not only that, but his purchase of the marker gave him and the Johnson estate a fair amount of discretion as to how or if the church might maintain its own cemetery. He was not above filing a lawsuit against the church, which created much tension within the congregation. 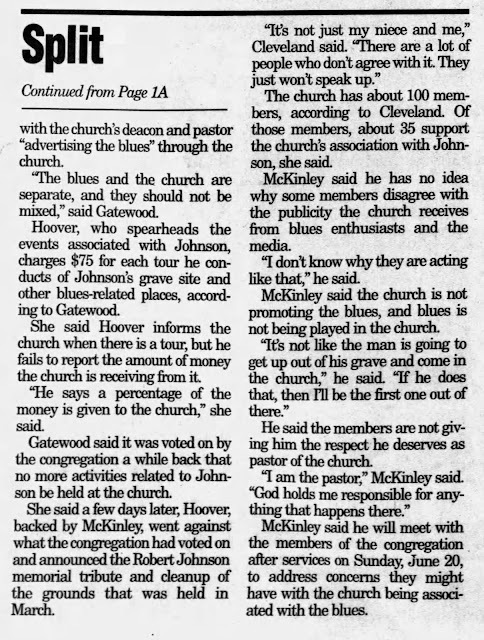 Instead of unifying the church by supporting the pastor, who was put in a very precarious situation by supporting the installation of a bluesman's grave marker, LaVere instead thwarted his efforts to prove the marker would be a boon to the church. The Greenwood Commonwealth, Feb 22, 2004. Old Juke Joint in White Station, Mississippi. About five miles outside Bentonia, in the middle of a cotton field, is an old, white washed house that used to be Jack Owens' cafe. It was opened only on weekends, like tonight, and also, like tonight, was usually filled with the soft blues of Jack's guitar and the harmonica of his partner, Bud Spires. The main room is now a kitchen, but the crowd of people, including those who have come to hear Jack play, bring back its old atmosphere. Along one wall is a wood stove which, as soon as it is fired up, warms the room, and Jack begins playing "Cherry Ball." 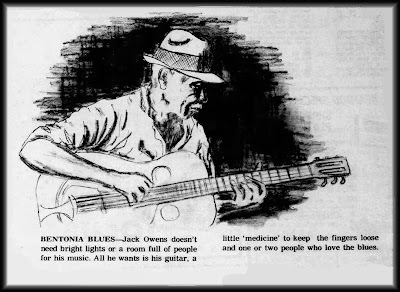 A short, stocky man whose wide grin reveals four gold teeth, Jack Owens has been playing the guitar and singing blues "ever since I was a baby crawlin' around on the floor." His harmonica accompanist, Bud Spires, has been wailing with Jack so long that "if he can pick it, I can blow it." Together they make the kind of music that the Southern black man is famous for—a soft but hard-driving blues that speaks from the bottom of his emotions. Mostly, he sings about love. About losing his best woman and getting drunk on Saturday night, or chasing after the younger and prettier girls. "About 40 years ago a group of us had a band," explained Owens, "but as time went on, we went our separate ways, some died, and some got married, and I was just left with the box." warm up their spirits with "Catfish Blues." Last summer a representative of Testament Records in Los Angeles, Calif., was traveling through the Delta and recorded some of Jack and Bud's blues on a record titled The Mississippi Blues of Jack Owens and Bud Spires. Guzzling some "nerve comforter" (a half-pint of Jim Beam) Jack and Bud are just getting warmed up, but it's getting late and time to go. "When are ya'll gonna come back. Why not tomorrow. Well, before you leave, I want to play you a song off my album." And a few minutes later, outside, on the quiet, moonlit Delta, "Good Morning, Little Schoolgirl" can still be heard. Sunday magazine of The Yazoo Daily Herald, June 11, 1978. He puts on a hat to play. Usually it's a cowboy hat, propped up on his grey head, but this time, it's a brown straw fancy-hat, with a brown band. He likes to drink that 'medicine' while he plays, to oil his fingers, and he likes to see people dance while he plays. He doesn't dance much himself anymore. He's Jack Owens, and he plays Bentonia Blues. Anybody can drive out to Bentonia to hear Jack play. Just jammin' on the 'box' and a little talking in between songs will keep him happy. Blues is the only music he knows. He didn't learn to play; no one can learn the blues. A singer has to be born into it, has to feel it as naturally as sitting down. There's a mystery to knowing exactly where to put those subtle pauses, those twangy, twitchy notes that catch the listener off guard, right in the middle of the back. Few people can resist the urge to jump into some dance. Jack's eyes are just starting to blue around the edges. They look kind of fuzzy and muddy, and are just about the only way to guess at his age. He says his uncle thinks he must be about 67, but the welfare people say he must be 75. Jack just doesn't know. His guitar is old, too. It's a dusty Yamaha, fingerworn and as soft as his singing. The strings are old, and the ends of them hang limply from the tuning heads, until he starts to play, and then they dance and jiggle as if they knew how good he can make them sound. He's been playing this box for awhile, but he doesn't remember when he got it. He used to have a national steel string, but somehow it was swapped off for the guitar he sings to now. All the old folks in his family, on both sides, sang the blues. Listening to the blues as a child, Jack loved it and fooled around with it until he could play. He dragged his guitar around with him, playing for birthdays, schools, follies, anything else until people started to hire him. He would play joints in the area, sometimes with a guy everyone calls Bud Spires, even though Jack claims that's not really his name. With Bud on harmonica and Jack caressing his guitar, many roadside clubs could swing up into the night. Jack thinks electric blues are alright. Before his daddy died in Chicago, he gave Jack an electric box—one that sat on the floor with a long cord. Jack couldn't quit his old wooden guitar, though; electric was just too much trouble. Jack says he has never written a song in his life, but he can boast that he has made up more than he remembers. All it takes is a little hittin' on the ole box, until the music comes, and then, before he knows it, he has got a pretty good song. He just starts picking those strings. He wears a pick on his thumb and silver picks on three fingers. The listener eases back into a rocker, and slides into the beat—slow and mellow. Jack doesn't sing loudly, but with just enough volume to tell his story. He sings songs like "Love My Cherry Bowl," "Please Give Me Your Money," "Hard Times Where I Go," and "Nothing But The Devil Can Change That Woman of Mine." B.B. 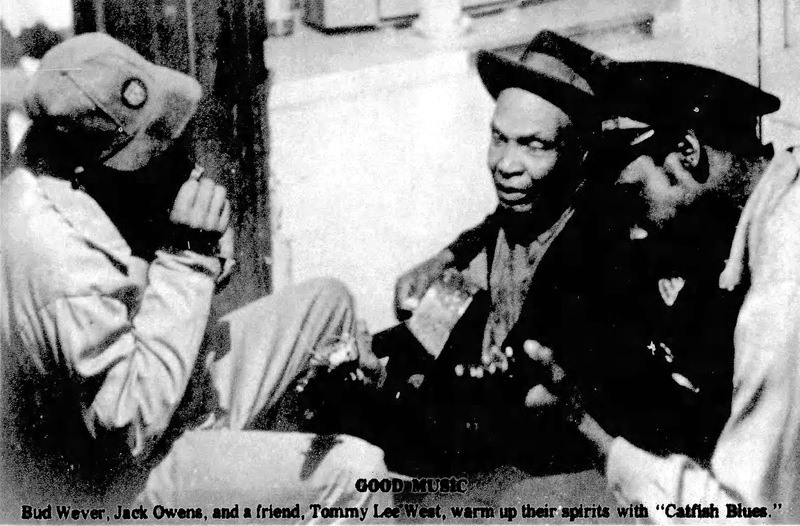 King and Lightning Hopkins are two of his favorites to listen to, but it's unclear how much of an influence the big-time blues singers have had on Jack Owens. He has got a style that's so delicate that his songs are plainly labeled as his. Sometimes Jack must think about getting old. He says he tried to write a letter once, but found out he'd forgotten how to write. But even if he slacks off his guitar for a while, he doesn't forget how to play. His music is too much of a feeling, a state of mind, too much of his life to forget. 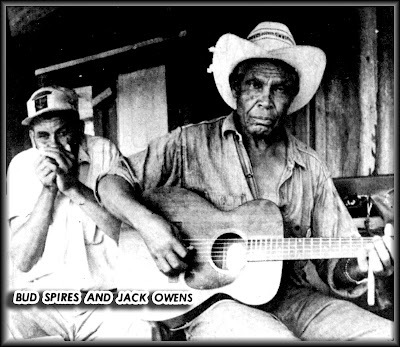 There used to be a lot of blues singers in Mississippi, but Jack says most of those old boys are gone. Maybe they went up North, maybe they died. Jack doesn't play around in the area much anymore, because people are too wild to be trusted. Even though he's scared to go out to play all night like he used to, people-still come to listen to him. A woman from England once interviewed him while she sought out blues singers, and somebody from California came to record him. Jack just barely remembers this. People in Bentonia know that all they have to do to get Jack to sit and play in the living room of his house for hours on end is to just show up there. Jack will run into another room and pull out the electric fan, if it's hot, and plug it up. He'll leave his guests sitting, listening to the goats climb all over that old beat up pickup with the rusty bedsprings on it while he hunts down his picks. He'll put on his hat and sit down in front of the wood-burning stove. His untied shoes will slap down on the tile floor—a medley of worn colors. Those gold front teeth will show under his broad grin, and his world will begin. He might not remember his visitors' names when they leave, but he'll be there to sing for them again. His living room always has the sound of tapping feet and slapped knees in it, out in Bentonia, under a tin roof. student, Mrs. Ollie Little, who didn’t “miss a class"
in an effort to upgrade her third-grade education. The Community Action Association building in Bentonia was once a small store. It isn’t very big and facilities are sparse, but on Wednesday evenings there is a hum of activity and mood of earnest determination. From the street it’s likely one could not correctly ascertain the number of people crammed between the walls, because there is a definite lack of automobiles in the few parking spaces in front. The people, nearly 30 most nights, do not own cars or much of anything else. They are the poor and illiterate folk who lived in Bentonia, who never got a chance for much education in Yazoo County before the 1970s. With the help of a 24-year-old native son, the students, ranging in age from 22 to 88, are doing something about their plight. Jimmy Holmes, a senior at Jackson State College, is leading them and from all accounts, they are most willing to follow. An athletic looking young man--and well he should be for his major is physical education--Holmes sports a slight mustache and an Afro. “Hopefully,” writes photo-journalist Ken Smith, “he is the ‘new breed’ of black leadership.” He is a teacher and his 30 pupils have an average of only seven years of schooling. Holmes dedicates his free time to helping the people of his community find a path from the darkness of ignorance. He called it teaching the “three R’s,” but technically the course was “basic education.” Assisting him in this project were the center operators, Willie Mae Johnson and Vidine Hilderbrand. 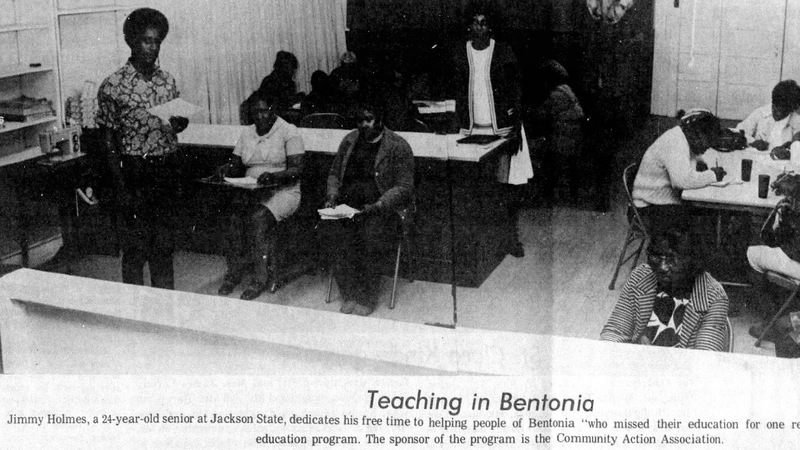 The students included Mattie Roberts, Ollie Little, Geneva Owens, Iola Gregory, Vernilla Wilson, Jerry Dean, Ira Hudson, Mattie Wilson, Cloritha Wilson, Georgia Hudson, Cliff Berry, Luretha Mason, Alberta Mason, Eva Margiu, Johnnie Walker, Fate Hammond, Christine Demus, Alfreda Shaffer, Lizzie Lee Hammond, Elvia Henderson, Matter Courthous, Vertistine Hubbard, Isaiah Johnson, Leslie Hudson, Flora B. Griffin, C.M. Harrelson, Josie Lee Anderson, Alma Williams and Ella Luckett. One of these students, Mrs. Ollie Little, is 88 years old, “but she never misses a class” said Mrs. Johnson. The students have a thirst for knowledge, for the education they missed, Walking a few blocks—or a few miles—to get to the one room school house isn't too much, and they are grateful for the opportunity. 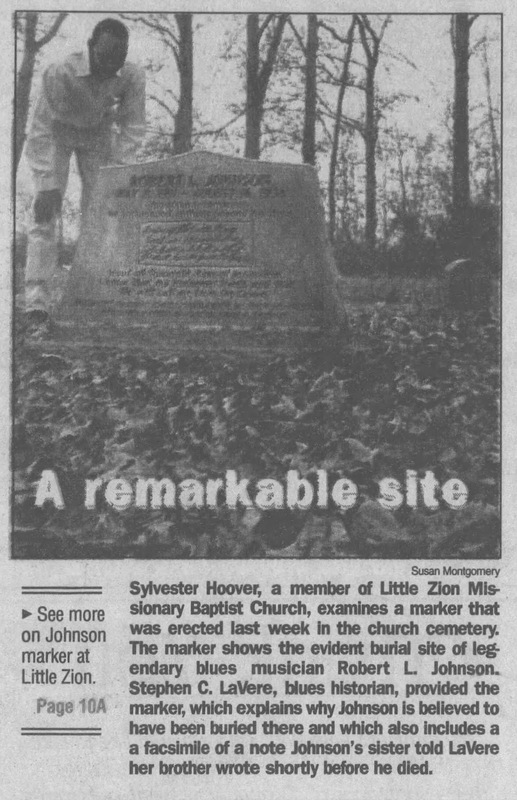 The Yazoo Herald, Mar 15, 1973. Sam Myers has been in the entertainment business for a long time. He has worked hard and invested a lot of time to make something of his talents. At 44, he may not have reached the biggest of the big times, but, to him, "everyday brings a change when you're climbing up the ladder." "I had a great struggle when I started out," he said. "Opportunities didn't come on a silver platter. You had to really put some hard work and time into it. I've been stranded in a lot of places trying to make a buck to get back home. But you've got to get that experience to really know how it is," said Myers, a local blues singer and musician. Myers, who has suffered a cataract condition since age 14 that makes him almost blind, started in music at 10. As early as 14, he was spending his summers away from school on stage with established Chicago musicians and looking for work. Although born in Mobile, Ala., he considers himself a Jacksonian be-cause he attended Piney Woods as a youngster. Piney Woods where he first became interested in music, was once located in Mobile, but later moved to Jackson. "One day while at school I heard a band playing," he said. "I asked Jonas Brown, who, even though I didn't know at the time, had been placed with me to find out my interests, where the music was coming from. He told me that it was the band playing and asked me if I wanted to go and watch. I said yes, and from there I went off into music. It was some-thing that really inspired me to stay in school," he said. In the meantime, Brown, now a minister in Jackson, went back to tell the principal of Piney Woods that he had finally found out what Myers was interested in, said Myers. "At first," said Myers, "I kept saying to myself 'I'm going to run away from this place.' but after becoming interested in music. I never wanted to leave the school when my mother would come to get me." During school he learned to play the drums, trumpet and trombone. He played with the marching band, swing band and sang with the choir. "The swinging band was really something then." he said. Myers, who recently returned from a tour of Europe has been performing around Jackson for the past 20 years. His fans are always' yelling. "Sing it Sam." And those that hear him for the first time after an ear of Sam's smooth blues, become loyal fans. In Northeast Jackson, he has per-formed at the Lamar Emporium, George Street Upstairs, C.W. Goodnight and recently performed at the Sheraton's Pyramid Lounge. Myers has written three albums and two singles. His three albums are on the T.J. Records label out of San Francisco. One of the singles was done on an ACE label and the other on the FIRE label of New York. In 1957, he recorded a single. "Sleeping in the Ground" and "My Love is Here to Stay" under the ACE label. In 1959, he recorded, "You Don't Have To Go" and "Sad, Sad Lonesome Day," a single under the FIRE label. While playing at Richard's Playhouse on Farish Street one night in 1978, an agent from T.J. Associates offered him a five-year contract with the company. "It sounded good to me so I signed," said Myers. Under his present contract he has recorded three albums, "Down Home Mississippi," his biggest seller, "Sam Myers Sings the Blues." and his latest release "The Worlds Wonder." Myers has been in and out of recording studios and has traveled with popular musicians since he got into the music business. 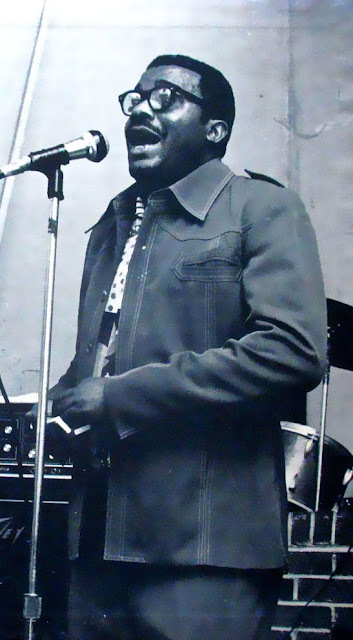 He has played and recorded with Muddy Water and other Chicago_ musicians. "At that time it was hard for me to get off into nightclubs as a solo performer,” he said. A lot of musicians have influenced Myers music. He has worked with Jimmy Smith an organist. and Charles Brown. a blues and jazz musician, both great artists of the 40s. "They influenced me to hang in there.' He also has also worked with Elmore James, a famous jazz guitarist and was also inspired by the music of trumpet player Broff Davis of Jackson State University, he said. After retiring from the road for a while, Myers started working full-time in a factory at the Mississippi Industry for the Blind and has worked there for the past 14 years. “But,” he said, “up until then I had always been able to make a living in the music business." Outside of entertaining, the work at the Industries for the Blind was the only other job he has ever had. "In fact, it was the first time ever having a Social Security card," he said. For 10 of his years at his new job, Myers was out of the music business, but he never got it out of his blood. Roland Freeman is driven by dreams that can hide in the guise of demons. Just watch him as he talks. He coils and uncoils in his chair, tenses his body or tosses back his head in a horselaugh, all depending on the mood of the moment, as a stream of ideas flow forth, racking his body like the pains of labor. He's a man driven by a vision of history. Southern Roads/City Pavements, the exhibit of this acclaimed photographer's work on display at the Old Capitol Museum, offers a major clue toward understanding Freeman's artistic obsession. It's the latest compilation of work from an artist/documentarian who intends nothing less than crystallizing the black experience within a lens frame before it is buried like a relic of a lost civilization. That dream pushes this young black photographer all over the world in search of black culture. Southern Roads/City Pavements pairs pictures shot in 13 counties in southwest Mississippi with photos of urban New York, Baltimore and Chicago, and Freeman is certain of the similarities, the shared tradition, even of the most dissimilar places. He's developed an eye for the black soul. But it wasn't always that way. Freeman was born some 44 years ago in Baltimore in the midst of the Depression and lived the street life to the fullest until he was 13, when he was sent to live on a Maryland tobacco farm. It was there he learned the love for the land that is so evident in his pictures of rural farmers. He grew up some more, joined the Air Force, won a Brownie camera in a crap game and became interested in a growing American civil rights movement. One march led to another until Aug. 28, 1963. 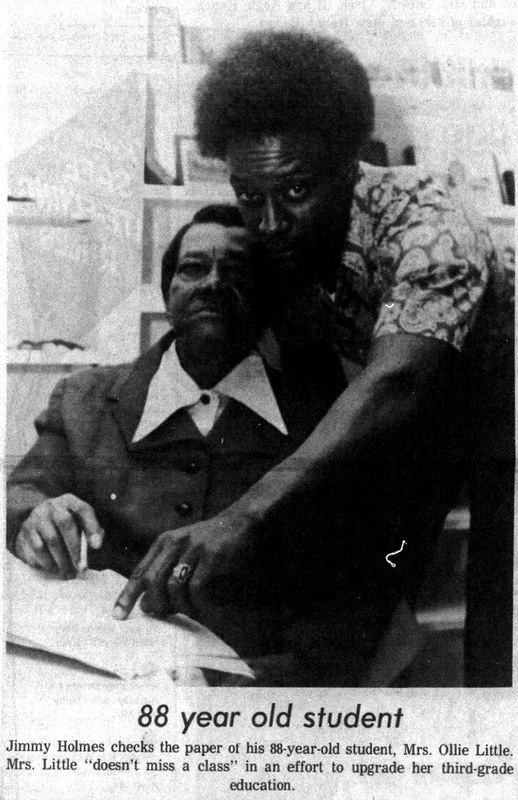 The march on Washington occurred that day and would forever more change Freeman's life. "I was so choked up watching that march that I knew I wanted to say something," Freeman said. Photography quickly revealed itself as his voice. 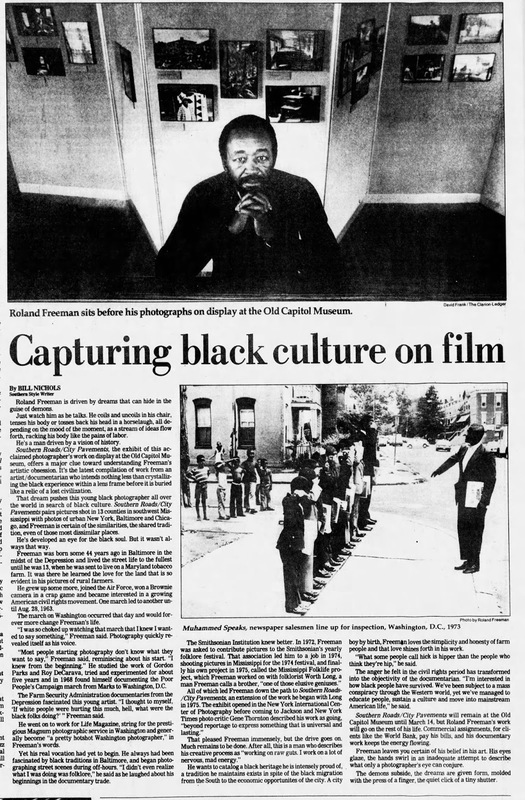 "Most people starting photography don't know what they want to say," Freeman said, reminiscing about his start. "I knew from the beginning." 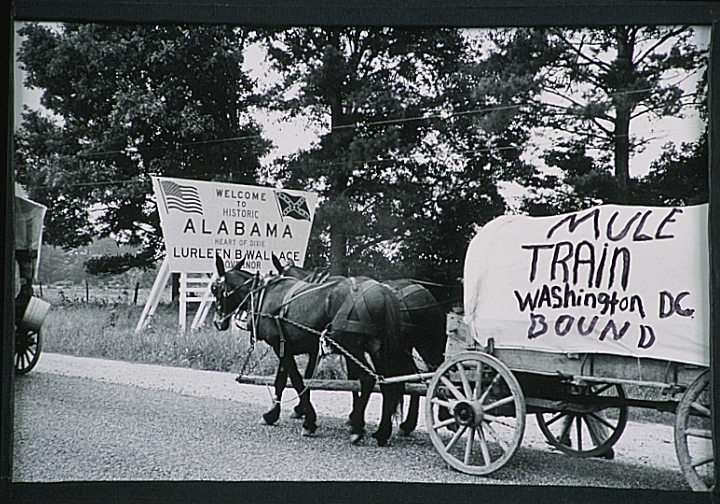 He studied the work of Gordon Parks and Roy DeCarava, tried and experimented for about five years and in 1968 found himself documenting the Poor People's Campaign march from Marks to Washington, D.C. The Farm Security Administration documentaries from the Depression fascinated this young artist. "I thought to myself, `If white people were hurting this much, hell, what were the black folks doing?' "Freeman said. He went on to work for Life Magazine, string for the prestigious Magnum photographic service in Washington and generally become "a pretty hotshot Washington photographer," in Freeman's words. Yet his real vocation had yet to begin. He always had been fascinated by black traditions in Baltimore, and began photographing street scenes during off-hours. "I didn't even realize what I was doing was folklore," he said as he laughed about his beginnings in the documentary trade. The Smithsonian Institution knew better. 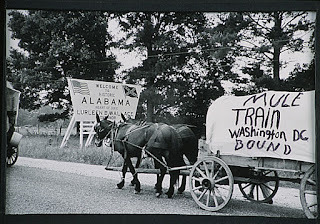 In 1972, Freeman was asked to contribute pictures to the Smithsonian's yearly folklore festival. 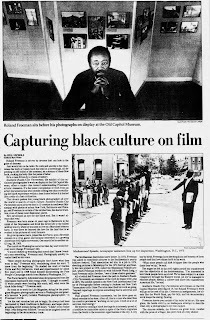 That association led him to a job in 1974, shooting pictures in Mississippi for the 1974 festival, and finally his own project in 1975, called the Mississippi Folklife project, which Freeman worked on with folklorist Worth Long, a man Freeman calls a brother, "one of those elusive geniuses." All of which led Freeman down the path to Southern Roads/City Pavements, an extension of the work he began with Long in 1975. The exhibit opened in the New York international Center of Photography before coming to Jackson and New York Times photo critic Gene Thornton described his work as going, "beyond reportage to express something that is universal and lasting." That pleased Freeman immensely, but the drive goes on. Much remains to be done. After all, this is a man who describes his creative process as "working on raw guts. I work on a lot of nervous, mad energy." He wants to catalog a black heritage he is intensely proud of, a tradition he maintains exists in spite of the black migration from the South to the economic opportunities of the city. A city boy by birth, Freemen loves the simplicity and honesty of farm people and that love shines forth in his work. "What some people call hick is hipper than the people who think they're hip," he said. The anger he felt in the civil rights period has transformed into the objectivity of the documentarian. "I'm interested in how black people have survived. We've been subject to a mass conspiracy through the Western world, yet we've managed to educate people, sustain a culture and move into mainstream American life," he said. Southern Roads/City Pavements will remain at the Old Capitol Museum until March 14, but Roland Freeman's work will go on the rest of his life. Commercial assignments, for clients like the World Bank, pay his bills, and his documentary work keeps the energy flowing. Freeman leaves you certain of his belief in his art. His eyes glaze, the hands swirl in an inadequate attempt to describe what only a photographer's eye can conjure. The demons subside, the dreams are given form, molded with the press of a finger, the quiet click of a tiny shutter. In the early 1900s, the only way across the Mississippi at Helena. Ark., was a ferry run by Harold Jenkins, father of country singer Conway Twitty. The ferry closed at midnight. "which was good in my favor," says Mrs. Hill. 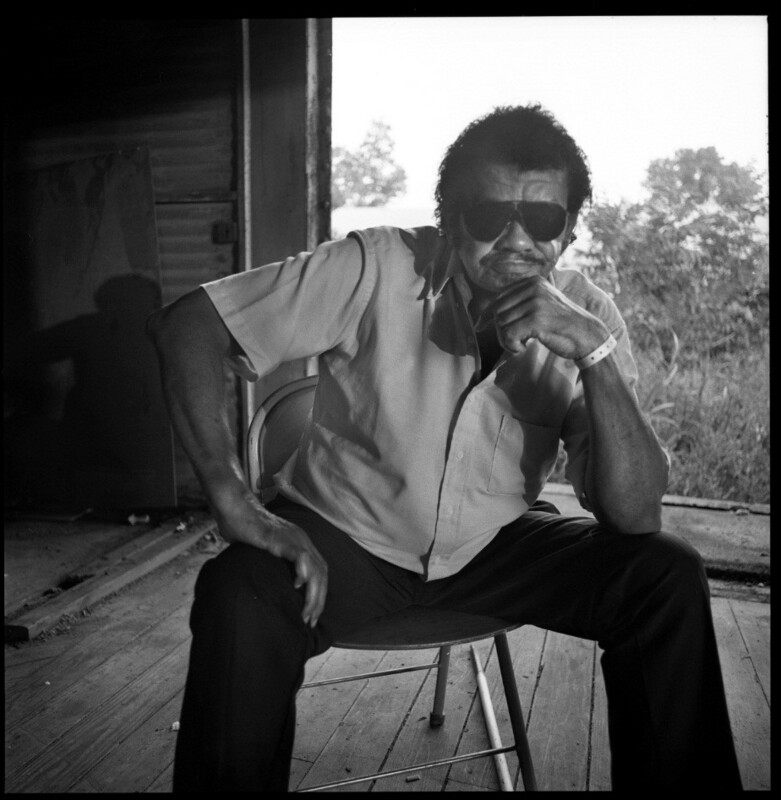 who still runs the hotel, when they were playing juke joints in Clarksdale or nearby towns. "When they had to stay over, they stayed with me," she says. The musicians kept a piano on the premises, and the place rang with music. During the 1960s, Williamson became popular with the rock generation. He played extensively in Europe and considered moving there. But, sensing that he was dying, he returned home a few months before his death in 1965. 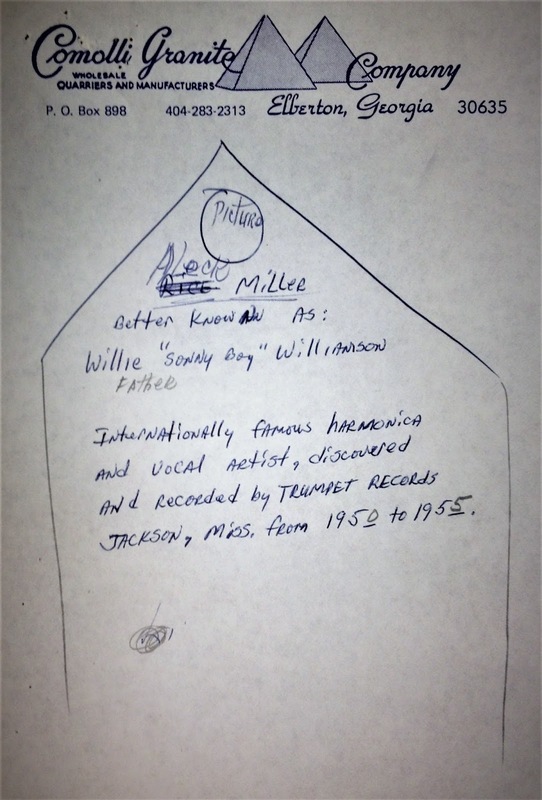 Mrs. Hill recalls that Williamson stopped by one Sunday afternoon and found that she was taking a nap. "Wake her up." he demanded. "I want to play some music." Williamson's grave is near Tutwiler, which is on U.S. 49. about 15 miles southeast of Clarksdale. No signs point the way, but it's not hard to find someone to direct you down a country road to the churchyard. Unlike in the 1980s, you won't find the musician's grave overgrown. 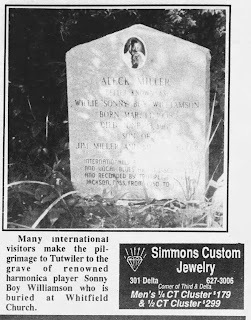 Tutwiler is a fitting place for a great bluesman's final resting place because it's also the place where W.C. Handy claimed to have had his first encounter with the blues, around the turn of the century. 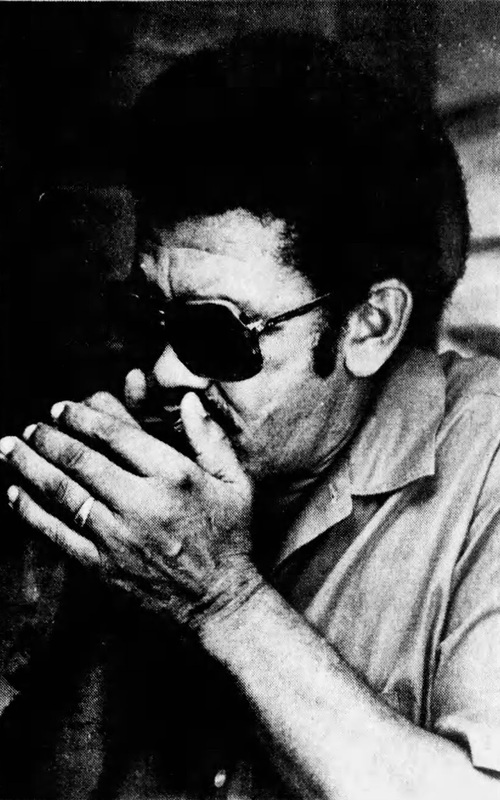 Handy, who orchestrated and popularized the folk music of his people and created such standards as St. Louis Blues, was a classically trained musician who had expressed little interest in the work songs and field hollers he'd heard. But he later recalled that his interest was piqued when. on a visit to play at a Tutwiler hotel. he was introduced to the weirdest music I'd ever heard." During a long night of waiting for a late train in the Tutwiler station, a ragged-looking man sat beside him and began playing a guitar. sliding a knife up and down the strings to produce a moaning, voice-like sound. Picking out a complex rhythm, he sang. repeating a line about "going where the Southern cross the Dog." a reference to the intersection of two railroads in Moorhead, Miss. Handy incorporated that line into his Yellow Dog Blues. In the 1980s and 1990s, tourists often made unsuccessful attempts to find the grave of the legendary harmonica player, and the gas station attendant often steered them to the small Whitfield Baptist Church. Beside it, in what looked like nothing more than weeds from the road, was the headstone with Williamson's picture cut into it. The grave was decidedly off the beaten track, but others had made the trek too. 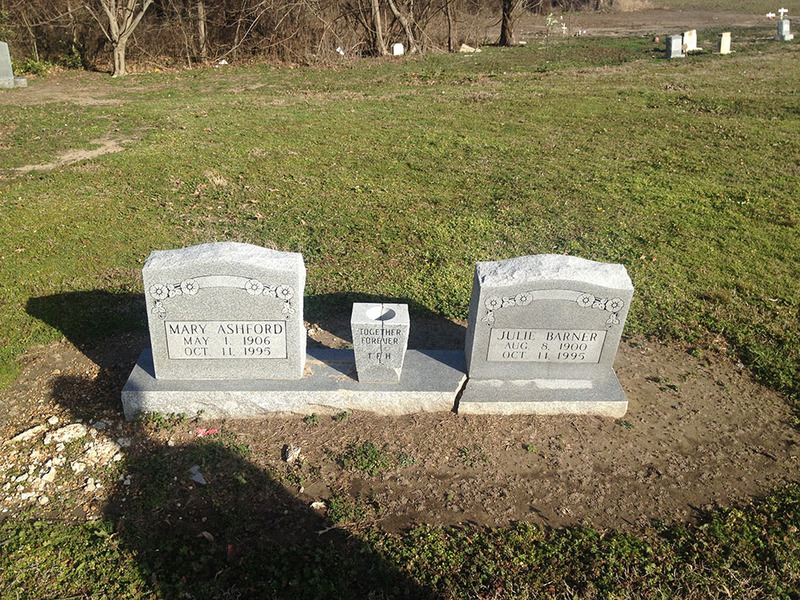 Fans often left harmonicas, guitar picks, even a pint of whiskey on the headstone. "It's this diamond of headstone, yet it's overgrown with weeds," said Joe Zochowski, host of Nothing But the Blues on WFYI-FM (90.1) in Indianapolis. "You have to look for it, to tramp through the weeds and cut through the briars and the B.S. to get to the heart of it. But people are willing to do it because they care that much about the music. That's a metaphor for the blues to me." "I'm hoping it'll be a big success," said Shepherd. "I'm looking for several thousand people to show up." He said he expects blues followers from out-of-town. The mayor noted that the festival, if successful, could become an annual event in the town. In the end, $100 was raised for the Sonny Boy Blues Society, which maintained the site for a while. Some folks gave lip service to disinterment and reburial in Helena, but the Mt. Zion Memorial Fund obtained a grant for local nuns, who maintained the property into the new millennium. 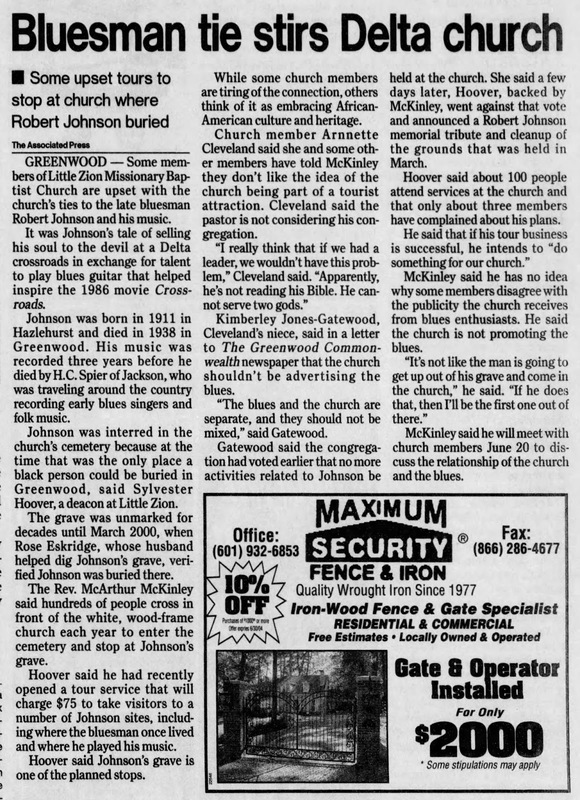 In late 1990, Living Blues magazine published an article suggesting, among other things, that Johnson was buried at Payne Chapel Missionary Baptist Church in Quito--about 2 miles from Mt. Zion MB Church--Morgan City. One woman, at least, remembered it that way. Known as Queen Elizabeth, Ms. Elizabeth Thomas claimed she was once Robert Johnson's girlfriend and she recalls his burial at Payne Chapel. She even pointed out the gravesite--about 30 yards from the white-frame church, near an old tree stump. "It's my gut feeling that it's at Payne," exclaimed Peter Lee, editor of Living Blues, "but I could never prove it. Who knew for sure?" "Admirers Mark Blues Musician's Grave"
Delta blues king Robert Johnson no longer lies in an unmarked grave. 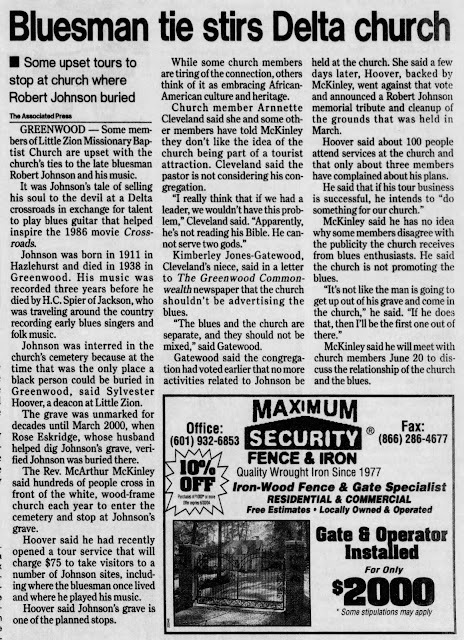 A group of Johnson's admirers, musicians from Atlanta, Ga., placed a marker on his reported gravesite in the cemetery at Payne Chapel Missionary Baptist (MB) Church. They were accompanied by Johnson's boyhood friend and fellow blues singer, Johnny Shines. Stevie Tombstone, lead guitarist for the Atlanta-based band the Tombstones, said, "It's a shame that there wasn't a marker there already. (Johnson) was a big influence on our music and we just decided to do it. Once we had the opportunity, we just did it. When Stevie says opportunity he means money. 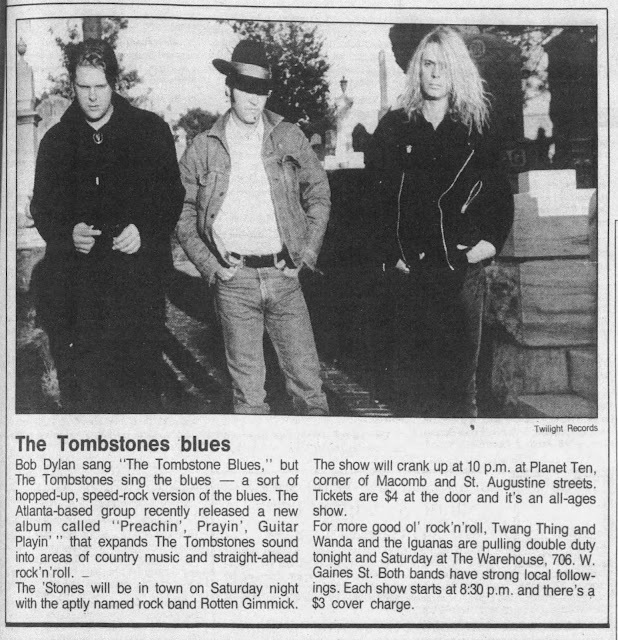 Although the Tombstones have been playing together for about six years in clubs and colleges, they just signed their first big recording contract with Relativity Records. 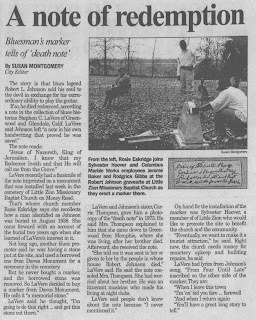 With their first advance check from the contract the three-sometimes four-member band bought the 125 pound marker for the grave of Robert Johnson. 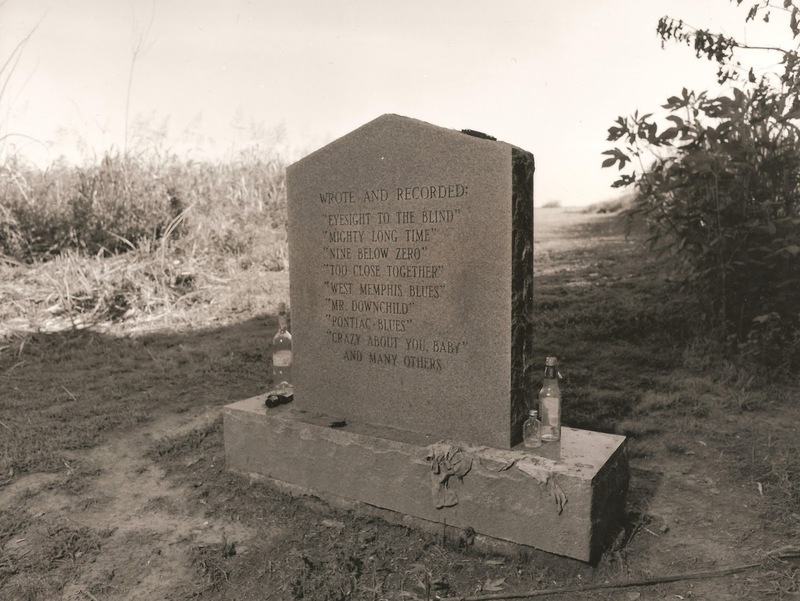 The Tombstones purchased this flat stone grave marker in honor of Robert Johnson, which sits on the spot pointed out by Queen Elizabeth. "Robert Johnson, Born -May 8, 1911, Died - August 16, 1938, Resting in the Blues." Rick Richards of the band Georgia Satellites was also at the service. `The way I see it, if it weren't for the blues we wouldn't have a job." Shines, who lives in Tuscaloosa, Ala., said, think he should have had a headstone a long time ago. His influence meant a lot to a lot of people and I'm glad to see this finally happening." While there are many rumors that blues music is associated with voodoo and Robert Johnson was reported to have made a pact with the devil, Shines said that blues is the basis of all other modern music. He explained that slaves used music to get messages across the fields to each other. 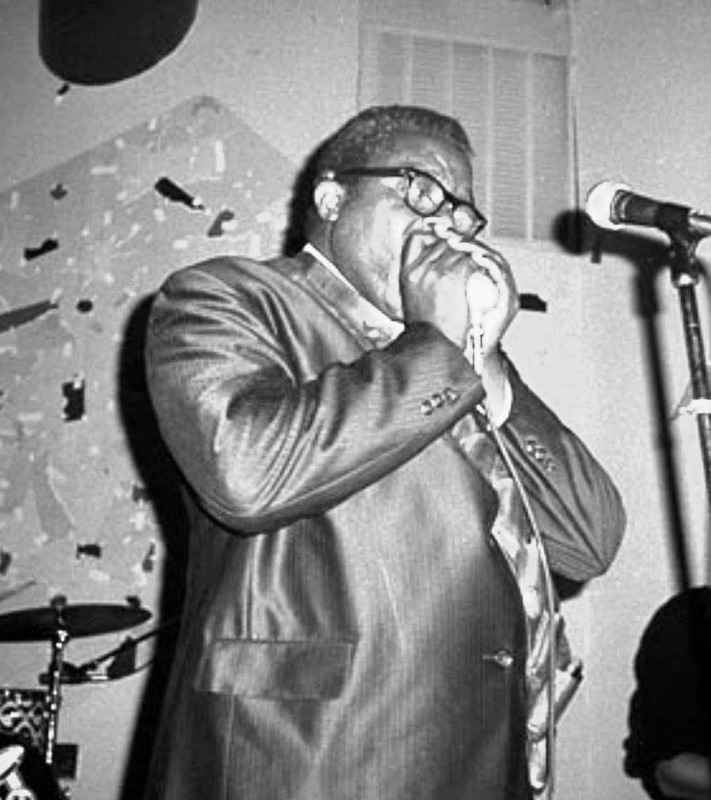 This lyrical communication became a way of life that is now called the blues. I have a God given talent to play the blues," he said. "If you don't use your talents they'll be taken away from you." Shines says he has proof of that. "In 1978 I quit playing the blues, and in '80 I suffered a stroke that paralyzed my left hand. I've started playing again now and my hand is coming back." Shines played one of the most famous Robert Johnson songs, "Crossroads," at the gravesite after the stone was laid. Stevie, Richards, folklorist Charles Locke and Tombstone manager Andrew Adler stood by silently, heads bowed, listening with the reverence usually reserved for religious services. And it was a religious service of sorts. While Robert Johnson has had a cult following among blues enthusiasts, the myths about his associations with the devil have kept his life and death shrouded in mystery. 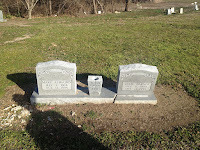 He was buried without a funeral service and no stone was ever placed a the gravesite. The only marker there was a small pot, rumored to be a sort of collection plate. People place money in the pot to buy Johnson's soul back from the devil. At last count, someone had contributed one penny. 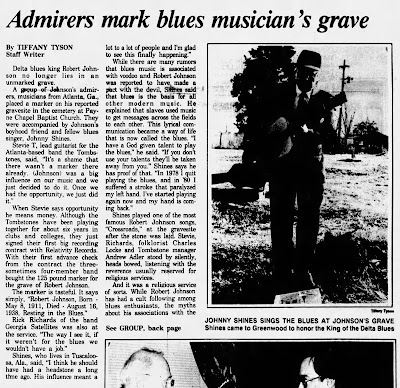 But now, 53 years after he with reportedly poisoned, he has been properly laid to rest with a marker and a service befitting the man known best as 'The King of the Delta Blues." Greenwood Commonwealth, Apr 20, 1992. 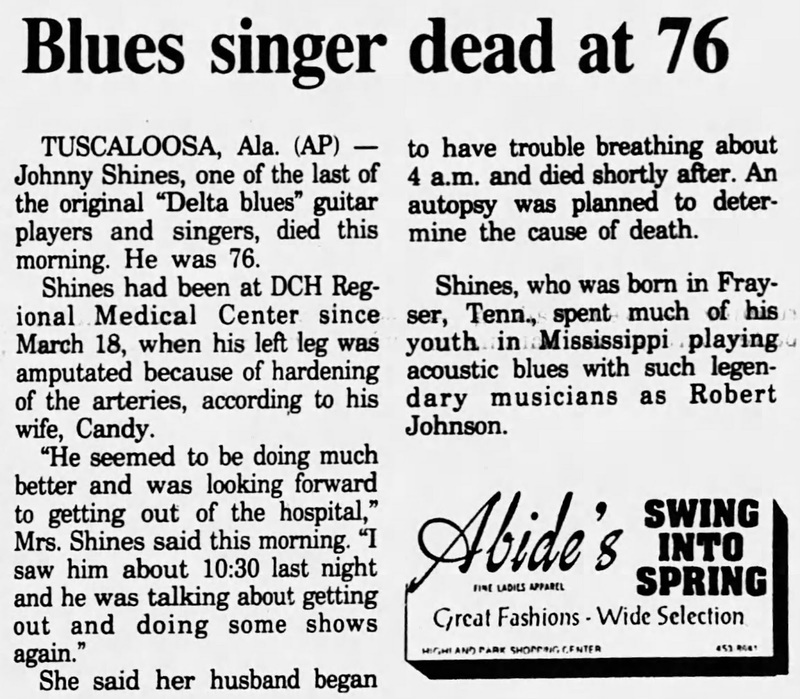 Johnson was reportedly poisoned at a have down the road from Payne Chapel church, located a few miles from lila Bena. 'there have also been reports that he was stabbed, although the cause of death is officially pneumonia. No one in the group wanted to speculate about his deals with the devil or the varied myths about when and where he was killed. They just wanted to remember a man they consider a friend. 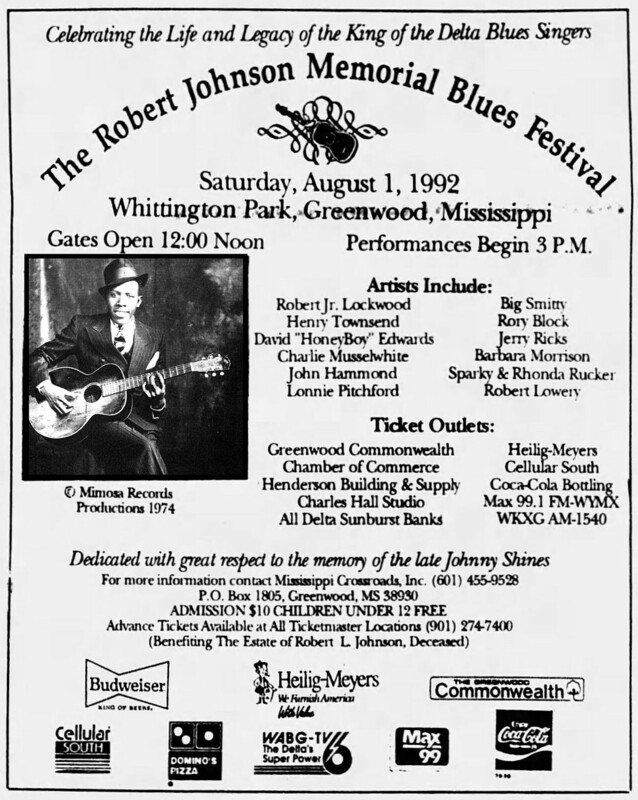 Festival (Greenwood) was dedicated to Shines. Shines explained Johnson's death this way. "Robert was versatile and he was way ahead of his time. That's why he had to die and that's why someone will come back and be as great as Robert Johnson was. I don't know who it will be yet, but someone will come back." Johnson's music is still alive and well. Columbia Records, who has been releasing Johnson's music regularly since his death, recently put out a two CD reissue set. "Robert Johnson: The Complete Recordings," has gone gold. The Tombstones, a band from Atlanta, had signed a record deal after several years on the road. 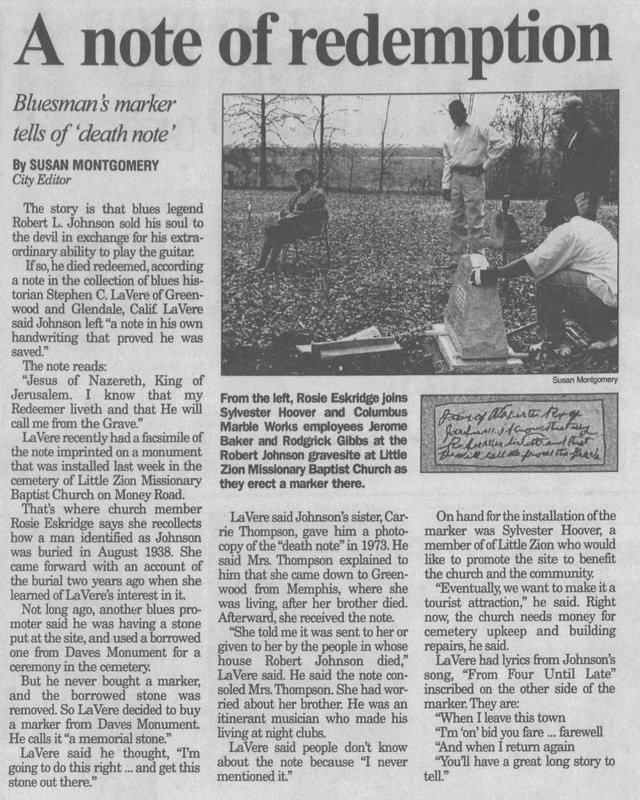 The band used some of its advance to purchase a flat marker for Robert Johnson and dedicate it at Payne Chapel. Johnny Shines attended the graveside service, and despite his ill health, even performed a few songs. The Mt. 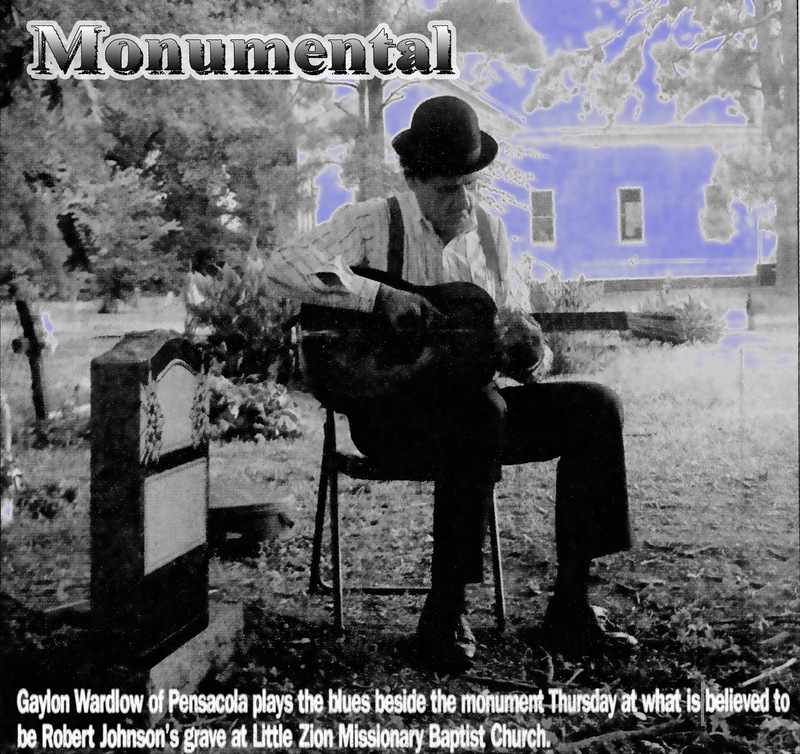 Zion Memorial Fund had already planned to commission a separate cenotaph to erect at Payne Chapel, but the Tombstones and a retired Johnny Shines did the honors themselves. Everyone at the time felt it in their bones that his remains were at Payne Chapel.